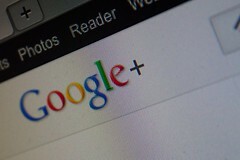 Google+ now offering pages for businesses - InsideOut Solutions, Inc. Businesses can now create branded pages on Google's social media platform, Google+. Businesses can now create branded business pages on Google+, Google’s social media platform. Last week Google+ began allowing its members to create pages for local businesses, brands, products, organizations, sports teams, and other entities. These pages look and function similar to Google+ personal profiles, allowing businesses to connect with consumers by sharing updates, links, and pictures. Businesses can also start Hangouts, in which up to 10 people can hold a video chat. Consumers can follow a business by adding that business to their Circles, similar to Liking a fan page on Facebook. Also like Facebook, the business page displays a counter for the number of people who have added the page to their Circles along with the profile pictures of up to eight of those people. Only one person can administer a business page at present. Unlike Facebook fan pages, on which multiple admins can post updates and manage settings, Google+ allows only one person to do so per business page. How do I get a Google+ business page? To get a Google+ page for your business, you must first have a personal Google+ profile. You can create one at plus.google.com. Once you’ve created your page, encourage other Google+ users to follow you, and keep your followers engaged by asking questions, building conversations, and posting a variety of videos, photos, and links.